This novel alternates between past and present, following the lives of a blind French girl named Marie Laure and a talented German boy named Werner. Marie Laure has grown up with her father in Paris. Her father works as a locksmith at a museum and Marie Laure spends her childhood learning and reading Braille. When the Germans occupy France during World War II, Marie Laure and her father are forced to evacuate the city and live with her eccentric uncle in Brittany. Unknown to Marie Laure, her father harbors a secret and a precious item is eventually left in her safekeeping. Meanwhile, Werner and his sister grow up in an orphanage in Germany. Werner is highly intelligent, and his fascination with radios eventually lands him at an elite Hitler Youth academy. He becomes the favorite of one of his instructors, and eventually he is drafted to serve as a radio tracker in Hitler’s army. His travels eventually land him in Brittany, where he crosses paths with Marie Laure. Both teens struggle to survive in a war torn country, but they soon find that perhaps the hardest battle is maintaining faith in humanity. This book receives my rave reviews. I actually read it for my most recent book club meeting, and was so enthralled that I immediately wanted to recommend it to everyone I know. Although technically an adult fiction book, this book would definitely appeal to older teens with more advanced reading skills. The short chapters make it seem fast paced even though it is a rather lengthy novel. Teens could certainly relate to the characters, as the characters are teens for a good portion of the novel. The story is set during a very tragic time in human history, and some of the content is difficult to read, but it is important to remember that these atrocities actually happened. The only way for history not to repeat itself is for new generations to learn from the mistakes of the past. This book is beautiful and lyrical, and leaves a lasting impact on the reader. Reader’s Annotation: Marie Laure is a blind French girl hiding from the Germans with her eccentric uncle. Werner is a German boy with extraordinary intelligence. When they cross paths, it becomes a story of sacrifice and survival. 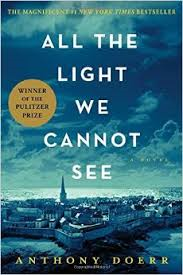 “Anthony Doerr was born and raised in Cleveland, Ohio. He is the author of the story collections The Shell Collector and Memory Wall, the memoir Four Seasons in Rome, and the novels About Grace and All the Light We Cannot See, which was awarded the 2015 Pulitzer Prize for fiction and the 2015 Andrew Carnegie Medal for Excellence in Fiction. Describe a sea shell from Marie Laure’s perspective. Describe Werner’s feelings when his friend defies orders and refuses to dump frigid water on a dying Jewish man. Justification of Selection: This is an extremely powerful book with a powerful message. Although technically an adult book, its tribulations of its teen characters give it crossover appeal.